The British crown colony, along with its treaty dependancies and the jointly administered regency territory of Parhoon, covers the entire Syrtis Major basin as well as parts of the adjoining uplands. Ralations with the Parhoonese, Meepsoori and Moerus Lacus highlanders are good, but relations are somewhat more strained with the subjects of the lowland cities. Britain is currently at war with the Oenotrian Empire. 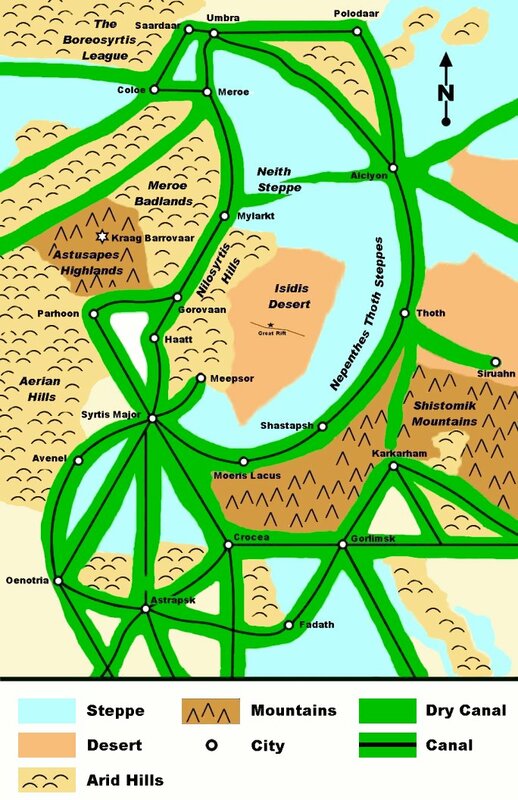 The City of Syrtis Major is situated at a major junction of several grand canals and was a major city-state and mercantile centre for centuries before it became the capital of Seldon's empire. The remains of the Imperial palaces are still imposing, although most of them were abandoned long ago. One of the smaller palaces is now inhabited by Amraamtaba X, Prince of Syrtis Major, deposed by the British in 1880. The Old Barracks: Originally one of the government buildings of Seldon's empire, it has been heavily rebuilt inside and out. The 5th Martian Foot is quartered here. The New Barracks: This building was constructed by the British in 1887 and incorporates part of the old Martian Imperial Mint. The South Wales Borderers are quartered here, and this is the location of the main British arsenal on Mars. The Residency: These buildings contain the offices and quarters of the governor-general of the colony. The residency is the administrative center of the colonial government. The buildings are of human construction, and plants from Earth have been imported to make the place as comfortable and familiar as possible for the families of Her Majesty's officials. The Explorer's Club: This rebuilt Martian building once housed the Martian canal excise offices under the Seldons. It now serves as a home away from home for members of the Explorer's Club. Membership is restricted to British subjects, and the dues are £5 per annum. The Legation Compound: This area is a mixture of new human-built buildings and older bulidings of Martian construction. The compound is surrounded by a low wall and contains the diplomatic representatives of several nations. The following nations maintain embassies: The Empire of Germany, the Republic of France, the United States of America, and the Empire of Russia. The following maintain consulates, or ministries of less than full embassy status: the Kingdom of Italy, the Empire of Austria-Hungary, the Kingdom of Spain, the Kingdom of Portugal, the Kingdom of Holland, the Holy See, and the King of Siam. The Shipyards: This facility is the only fully equipped European shipyard on Mars, and is the only place where modern aerial gunboats can be built on Mars. Vessels of other nations must either be purchased from the British or imported in pieces and assembled. The Harbour District: Located at the junction of the canals, the Great Harbopur once serviced the fleets of canal boats that came to Syrtis Major. Now it has become a criminal quarter, home for every sort of low character and wretched ne'er-do-well imaginable. The Bazaar: This is the market for all the wealth and treasures of the world. Here for a price, one can buy anything from a paper of dressmaker's pins to 100 Winchester Model 1889 repeaters. The Emerald Palace: Constructed completely of the pale green Meroe limestone (hence its name), the Emerald Palace is now the residence of Amraamtaba X, Prince of Syrtis Major. The Prince holds no power and is the last of his lineage. When he dies, his lands become crown property, and his children will be forbidden to call themselves "Prince" by the terms of the Treaty of Parhoon, which ended the Second War of Parhoon Succession and legalized the annexation of Syrtis Major, among other city states, into the British colony. Amraamtaba's lands are already under the direct administration of the British governor, and his only income is a British subsidy. Amraamtaba quietly hates the British and plots against them endlessly and incompetently. "What was that chap's name again, Sah Major?" "The Yank, sah? John Carter, sah." "Oh, yes. A Virginian. Gone native, eh?" "Yes, Sah. Marshies say he's more more Martian than they are. 'He is made of the sands of the deserts, with the waters of the canals flowing through his veins.' What rot." "Pity. But what can one expect from an American..."
Science-Fiction Role Playing in a More Civilized Time. Space: 1889 is Frank Chadwick's registered trademark for his game of Victorian Era Space-faring.